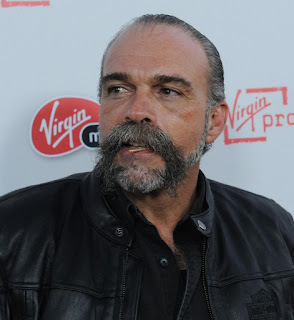 Movie Ramble: Machine Gun Preacher. Sometimes the name of a film can be completely misleading, Machine Gun Preacher (2011) sounds like a grindhouse movie similar to Hobo with a Shotgun (2011), Death Proof (2007) or perhaps Machete (2010) but its not. Marc Foster the German-Swiss filmmaker responsible for such diverse work as Monsters Ball (2001), Finding Neverland (2004), The Kite Runner (2007) and the last James Bond film Quantum of Solace (2008) has based his latest feature film on the life story of former outlaw biker turned Christian, Sam Childers. Up until he was 30 years old Childers was a violent drug dealer, drug addict and alcoholic until he saw the light in the summer of 1992 and converted to Christianity. Following this transformation, in 1998 he made the first of many trips to Sudan and along with his American based wife founded the Angels of East Africa, building a children’s orphanage in Southern Sudan in the middle of Joseph Kony’s Lords Resistance Army’s (LRA) territory. The Children’s Village currently houses over 300 orphans and has rescued over a thousand children since its inception. As well as its unfortunate title the movie has other problems. 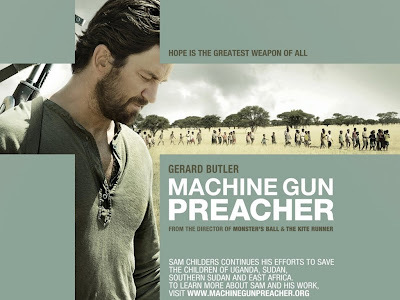 Childers’s conversion from criminality to self-righteous preacher and businessman is not totally convincing because of the speed that it’s portrayed in the movie. Gerard Butler’s portrayal as the Rambo of the Christian Right is not very compelling; I’m aware he can act, because of his performance as the vicious warlord Tullus Aufidius in Coriolanus (2011). The supporting actors are certainly not used to their full potential, Michael Shannon as Childers lifelong friend Donnie and Michelle Monaghan as the ever-dutiful wife are played out as formulaic clichés. The script is far from perfect and the direction leaves a lot to be desired but it has the basis of a cracking good yarn and I feel it could have been done far more interestingly as a documentary, going by the real life clips that accompany the credits.